Kubilay Mert Ural’s pieces at this year’s event include a number of paintings and a UFO sculpture that referrs to his subconscious and childhood memories. The Dutch autumn has already shown its face in November and Amsterdam is much colder than it is in my hometown Istanbul. I heard the Dutch language has more words for bad weather than the Eskimos. But luckily there are a number of artistic events in the city, including the Amsterdam Art Weekend and the Rijksakademie's open day that can keep you warm.The RijksakademieOPEN is a unique event that showcases the recent works of the resident artists and discovers trends and innovations in contemporary art, featuring 45 international artists who presented their yearly work. The institution has given 50 international artists an opportunity to work under the artist residency program. It provides them studio spaces for research, experiment, development, and production. The resident artists also get budget and scholarship - a great opportunity for emerging artists. Every January, there is an open call for this special artist residency. Turkish artist Kubilay Mert Ural primarily works with paintings, video and sculpture. His works at this year's event included a number of paintings and a UFO sculpture that referred to his subconscious and childhood memories. The fact that he did not study painting gives him the opportunity to create something unique. Ural doesn't use proper perspective rules in his paintings, which remind of traditional Turkish miniature artwork. His paintings suggest a reading where past and present interact with one another. German artist Joscha Steffens' project "UCHRONIA," focuses on a secret occultist Nazi tribe living on a secluded island. The members of this fictitious community never accepted that World War II has ended and continued their duties as SS (Schutzstaffel) and Wehrmacht soldiers of the German Reich.A photographer by profession, Joscha explores the boundaries of sculptures in his presentation. His works include a huge metal time machine from the Nazi tribe and some old letters. It is an interesting and meaningful take on the recent rise of far-right politics in Germany. After World War II people thought there would never be war or fascism like this again but they have all been proven wrong. Eroğlu is a Danish-Turkish artist who explores the processes of migration and identity formation. 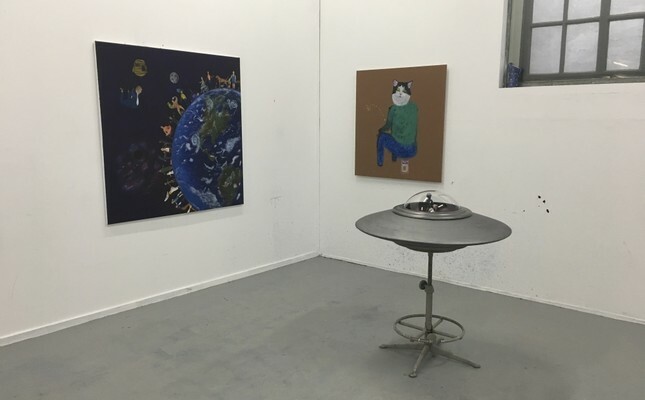 Eroğlu presents his pieces in two different rooms. In one room he shows a film called "Mountain Elegy," which was shot on 16 millimeters. The film takes place in northern Turkey's Ordu, where Eroğlu's father lives. The film investigates the memories of displacement and the memory of the space in a poetic way.In the second room, the artist deals with the same subject with a completely different approach. If I had not seen the names, I wouldn't be able to say they belonged to the same artist.Here two 3D animations, "North West" and "Marches of the Cockroaches," take a humorist approach on the current refugee crisis as he points towards Europe.We see a rat talking with a refugee boy named Fugi in "North West." In Europe rat is a symbol of plague and Eroğlu uses the rat as the symbol of the refugee crisis in parallel to the mainstream media portrayal of refugees as people who will bring diseases, terror, poverty to the western countries. Europe's far-right groups have also used this argument frequently. I think this was my third encounter with Pakistani artist Bashir Mahmood's works this year. "All voices are mine" is a film for the big screen. It depicts a visual narrative that takes place in Lahore, Pakistan.Mahmood collected memories of actors, writers, and filmmakers from the local film industry often called Lollywood. In its heydays, Lollywood was one of the biggest film industries in the world.In Bashir's film, the characters seem like amateurs who have no experience in this field, however, the way he directs them to make the film professional and the characters' movements eventually transform into performative gestures. Some of his shots have the aesthetics of Russian director Andrei Tarkovsky. Kuwaiti artist Monira al-Qadiri's site-specific installation "The Craft," is designed as an American hamburger restaurant. It narrates a fictional story on a TV screen hanging from the ceiling. The story starts with an unusual dream where the artist and her sister find their mom has been captured by a UFO, which landed in their backyard. "The Craft" deals with the unstable political environment in the Gulf, where everything sways between reality and fiction. Decontextualizing of the autobiography in the project plays a unique role. Perhaps Qadiri is trying to trick the idea of "official" representation of reality by creating an alternative reality, blended with fiction.